Microgroove, the title of John Corbett’s new collection of writings on music and other arts, is meant to capture two notions. The first, in which microgroove refers to the technology that facilitated the long playing record, is an allusion to the importance that recordings have had for Corbett’s musical development. The second consists in the acknowledgement of the semi-recondite communities of artists and listeners grooving in those thinly inhabited spaces at the borders and intersections of genres—which translate into the literal, physical world of relatively micro spaces of art galleries, lofts and basements in which adventurous music is made and received. 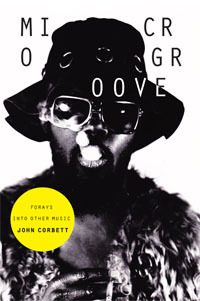 Microgroove follows by twenty years Corbett’s first collection of writings, 1994’s Extended Play. Like that earlier book, this one includes essays, interview and profiles. The musicians covered represent diverse fields ranging from jazz to European improvised music to punk to cartoon soundtracks to the more challenging reaches of Western art music. Corbett also includes pieces on poetry and dance as well as the visual arts, this last of which having become an increasing interest of his in the time between the two books. Although Microgroove covers a wide spectrum of music, Corbett’s particular emphasis is on music that is improvised, particularly jazz and European free improvisation. In his introduction he makes a claim for improvisation as being perhaps the most important factor in shaping twentieth century culture. Given the influences of jazz on the art music of the last century, as well as the salience of the creatively unsettling experiments in indeterminate composition and graphic and other post-literate, open-form vehicles of notation, Corbett’s claim is certainly convincing. Other art forms—painting, poetry, theater and dance among them—have also been heavily influenced by improvisational practices in composition and/or performance. Think, for example, of Jackson Pollock on Long Island painting to the sounds of (traditional) jazz. Originating more often than not in small, specialized subcultures that assimilated some of the lessons of jazz as well as the influences of Zen Buddhism, Existentialism and related intellectual trends, a culture of spontaneity, to use Daniel Belgrad’s apt expression, rippled outward from music to impact practices in most of the arts and to shape the culture in general as well. Thus a good number of the artists Corbett interviews or writes about are improvisers of one sort or another, generally from the more experimental edges of their fields. Interviews with Steve Lacy, Misha Mengelberg and Hans Bennick, Peter Brötzmann and Evan Parker, Ornette Coleman and others provide insight into the very different ways that improvisation can be approached and realized in sound. Corbett’s interviews with writers Clark Coolidge and Nathanial Mackey bring out the sometimes direct and often subtle connections between improvised music and the written word, while interviews with painter Albert Oehlen draw lines between sound and visual art. One of the more interesting features of Microgroove is the inclusion of multiple pieces on some of the artists. This allows Corbett to consider them from different angles or over time, providing a fuller picture of their art in the process. That, combined with the eclectic scope of Corbett’s interests, makes of Microgroove a rich, multifaceted survey of some of the more challenging artists of the last two decades. American trumpeter Nate Wooley teams with British free jazz percussionist Paul Lytton to form a textural, avant-garde duo. Wooley impresses with virtuoso playing, creating lush, minimalistic sounds with electronics and obscure tones. Lytton is a legendary player who incorporates a clutter of objects like water, a flour sifter, and wooden blocks into his kit playing. Tetuzi Akiyama (guitar), Bryan Eubanks (saxophone, electronics), Jason Kahn (drums, percussion) and Toshimaru Nakamura (no-input mixing board) fuse free improvisation, noise, experimental electronics and the uncategorizable in a fresh and vibrant approach to group playing and spontaneous music creation. Presented by Nonsequitur. Supported by the Japan Foundation through the Performing Arts JAPAN program. Japanese percussionist Tatsuya Nakatani leads the Seattle version of his Nakatani Gong Orchestra, which builds community ensembles performing on multiple bowed gongs under his direction. For each show, he gives specialized training to locally selected players. Each player is able to quickly learn about the gong instruments, playing techniques, and conducting signs. THU. 11/5 – Due to cancellation THIS SLOT IS AVAILABLE! Contact Steve if interested. On Sunday night at National Sawdust in Brooklyn, Stephen O’Malley of the group Sunn O))) played a set of solo electric guitar while a film ran behind him: parts of “Unground,” by Gast Bouschet and Nadine Hilbert, showing high-contrast black-and-white close-ups of a dripping underground ceiling. The music gave no indication that it was going to change much, and, in a formal sense, it didn’t; it stuck, more or less, to a single chord. November 21, 2015 – Sat.